The church of In-N-Out has long worshiped at the altar of "Animal Style" -- the not-so-secret secret menu item that loads a standard burger with pickles, grilled onions, extra spread, and mustard-fried patties. But now, you don't even need to be in a California drive-thru to get animalistic. House of Yumm has brilliantly adapted Animal Style into a grilled cheese recipe with an identical sauce and grilled onions... the only thing missing would be the meat and pickles (which you can definitely add on your own). 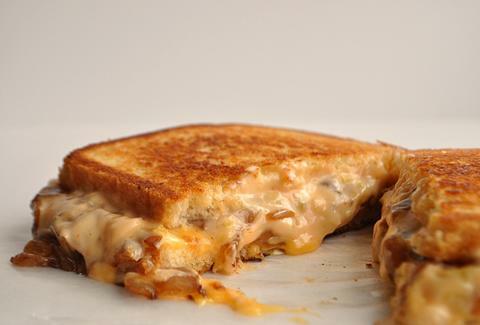 It is undoubtedly the messiest grilled cheese you will ever eat, but really, messiness is the essence of any real animal. Kristin Hunt is a food/drink staff writer for Thrillist. If she could copy the style of any animal, it would be the honey badger. Follow her at @kristin_hunt.